Personalized House Sign with Flower Border - - uniquely shaped cut-corner rectangle plaque contains detailed floral accents as well as a solid circle in the center with the house number. Made in USA. Wall mount address plaque made to order in your choice of 7 color combinations and one line of personalization. Line 1 holds three 3" characters or two 4.5" characters (including any spaces or punctuation). Specially formulated paints have been weather tested to withstand the harshest elements. "Pick color" "AB antique brass" "AC antique copper" "BG black with gold characters" "BS black with silver characters" "BW black with white characters" "GG green with gold characters" "OB oil rubbed bronze" "OG bronze with gold characters" "PS pewter with silver characters" "RG red with gold characters" "WG white with gold characters." 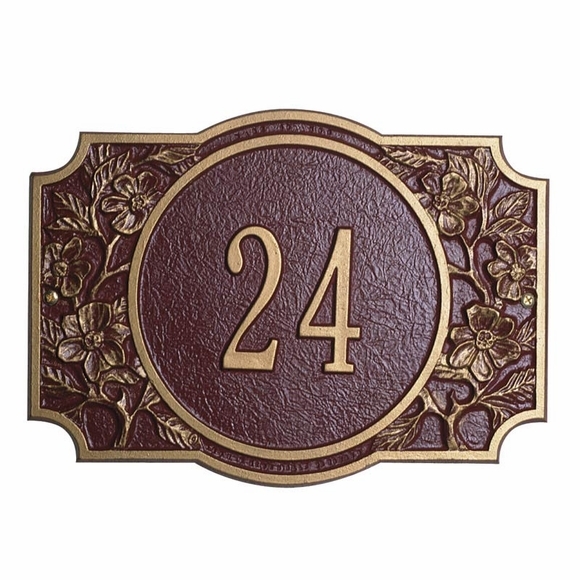 Wall mount address plaque made to order in your choice of 11 color combinations and one line of personalization. Made in USA.